News of yet another price cut now as John Weller and Bruce Leffers at Northrop & Johnson send word of a $700,000 drop on the 40m Feadship Seagull of Cayman. A classic canoe stern yacht built by the De Vries yard in 1980, she was refitted in 2006. Accommodation is for 12 guests in six cabins and twin GM engines give her a cruising speed of 13 knots. 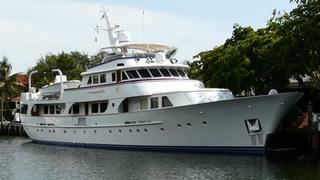 Lying in Fort Lauderdale, Seagull of Cayman is down from $6,450,000 to $5,750,000.